Jenny is the Science Communications Specialist at Canadian Blood Services working out of head office in Ottawa. 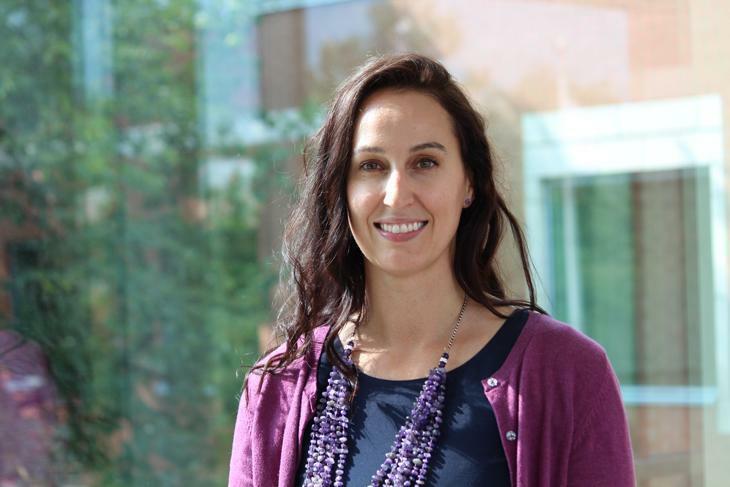 She works closely with the Medical Affairs and Innovation division to interpret and showcase new research and discovery in transfusion and transplantation science. 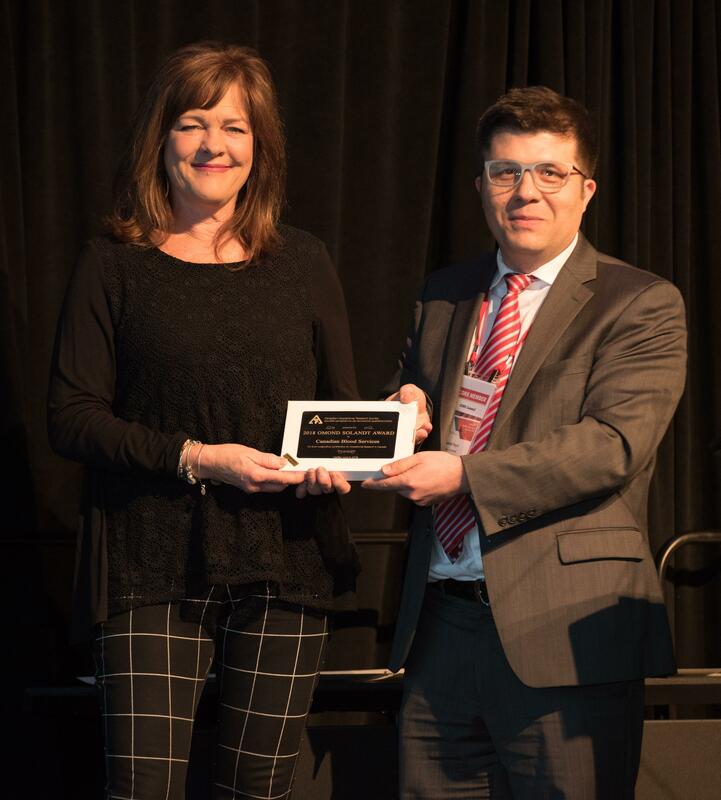 On June 5, Canadian Blood Services was honoured to accept the Canadian Operational Research Society's Omandt Solandt Award at a reception in Halifax, Nova Scotia. Michelle Rogerson, Director, Supply Chain (Atlantic), Canadian Blood Services, accepted the award on behalf of the organization. Dr. Omand McKillop Solandt was the first president of the Canadian Operational Research Society. He was a physician and surgeon, who graduated from the University of Toronto and did post-graduate work at Cambridge in the 1930s. When the Second World War broke out, Dr. Solandt investigated the fighting conditions in armoured vehicles. His early work lead to the discovery that exhaust from the main gun feeding back into the tank caused crew members to lose consciousness. Solandt was instrumental in the founding of Operational Research and he became Superintendent of the British Army Operational Group in 1944. Following the war, he became Director General of Operational Research in Canada and founding chair of the Defence Research Board. Dr. Solandt later worked for Canadian National, de Havilland Aircraft, and the Canadian Geographical Society. Awarding the Solandt prize to Canadian Blood Services is particularly apropos, since Dr. Solandt’s career began as a blood banker. Delivering blood products to Canadians efficiently and effectively is a key element of Canadian Blood Services’ mandate. 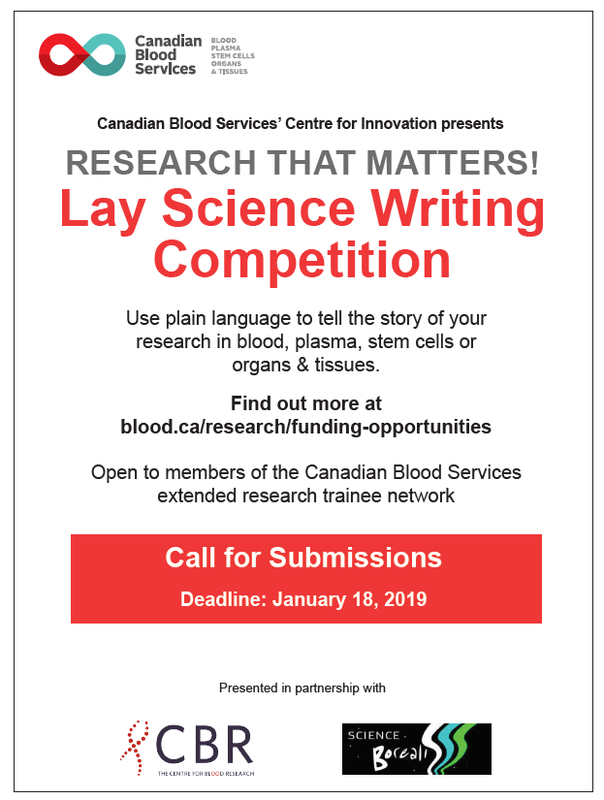 As part of our day-to-day business and, through our support of research, Canadian Blood Services is both a practitioner and creator of operational research. As described in the award citation, Canadian Blood Services has a cadre of industrial engineers working in areas such as supply chain and donor services to increase donor satisfaction and retention, develop innovative production methods, and create seamless, integrated delivery networks. A recent, remarkable pairing between Canadian Blood Services and Toyota Canada saw the application of operational research and industrial engineering methodologies while rolling out lean production techniques in the organization’s Brampton production centre. We have also supported the development of new operational research knowledge through applied research conducted with researchers such as Dr. John Blake at Dalhousie University. 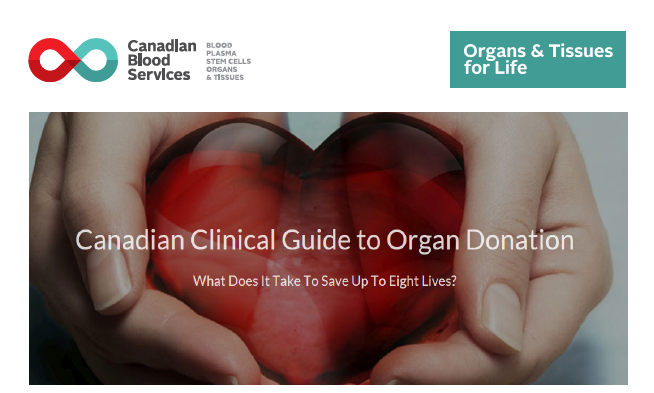 Canadian Blood Services has used operational research, developed in house, to bring evidence-based decisions to complex and contentious issues such as consolidating regional production centres or determining the optimal ethnic composition of the nation’s adult stem cell donor registry. We are proud to be recognized for the application of operational research and continued development of new operational research knowledge through the 2018 Omand Solandt Award. Through our Rare Blood Program, we make sure lifesaving rare blood is available to patients whenever and wherever it’s needed. A person has rare blood if only one person in 500 has the same combination of antigens as they do. And if only one in 1,000 people has that same combination, that person’s blood is considered very rare. Dr. Gwen Clarke answers a few questions about rare blood and Canadian Blood Services' rare blood program. Because antigens are inherited, family members of known rare blood donors or patients with rare blood types may also have rare blood. Because blood types are inherited, a person with a rare blood type may have family members with that same rare type. In fact, the chances are one in four that the brothers or sisters of a person with a rare blood type will have the same rare type. Patients who need rare blood are encouraged to speak with their siblings and ask them to consider becoming a blood donor by contacting the Rare Blood Program to arrange for testing. Rare blood donors can give blood every 8 to 12 weeks — but may also be called upon as needed if their specific rare blood type is urgently required. Rare blood is rare all over the world, not just in Canada — making it important for national and international blood operators to work together. 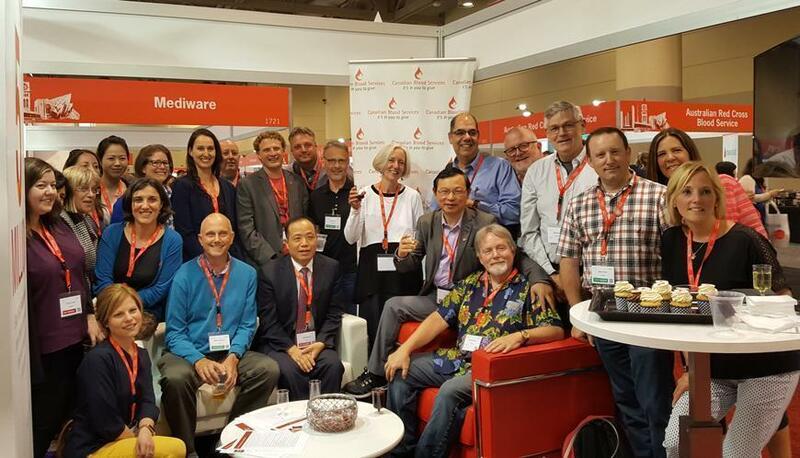 Canadian Blood Services is proud to partner with the International Rare Donor Panel (IRDP). Each unit of rare blood can be frozen in long-term storage so it can be available when needed. But if no units of a rare blood type are available in any of our facilities — and if no donors can come in and donate right away — we contact the IRDP. The IRDP database comprises more than 5,000 rare donors in 27 countries. 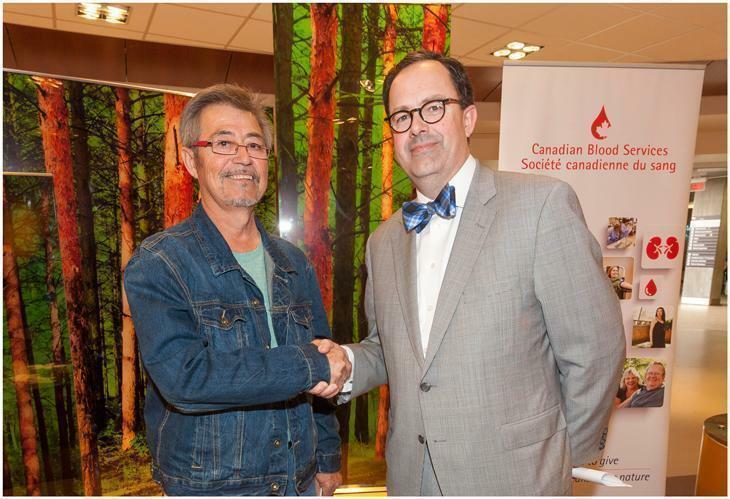 This partnership helps ensure patient needs for rare blood are met here in Canada. And because Canadian donors are part of the IRDP database, we can do our part in helping other countries meet their patients’ rare blood transfusion needs. 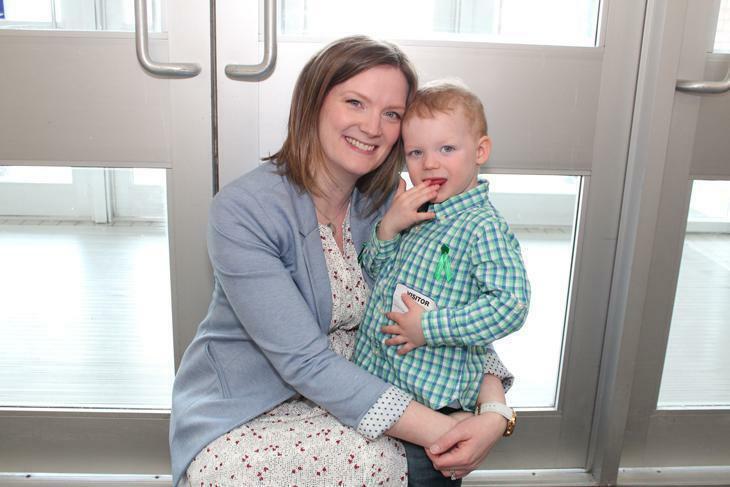 In this six-part series, Dr. Jeannie Callum, a hospital-based transfusion specialist, shares her real-life experience witnessing the impact of blood donation on patient lives. She provides some fascinating insight into blood transfusion, past and present, and emphasizes the need for male donors and why some donors may be safer for patients. Read the complete series here . On May 5th, the Kidney Foundation of Canada announced that Dr. Peter Nickerson is the winner of their 2018 Medal for Research Excellence. A well deserved honour indeed. We're proud to congratulate Dr. Nickerson on this award. Dr. Nickerson is widely recognized for his role in building a national transplant network for hard-to-match kidney patients. 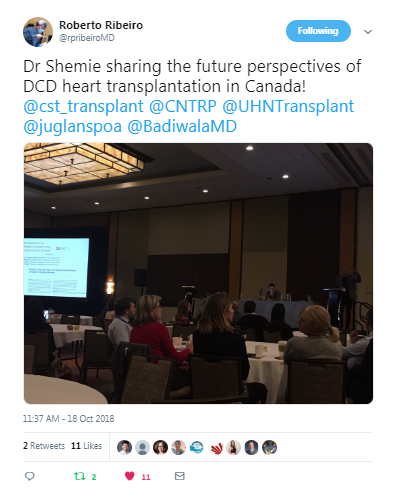 As medical advisor with Canadian Blood Services’ Donation and Transplantation program, he was instrumental in developing national kidney programs such as the Highly Sensitized Patient (HSP) program that is giving new hope to Canadians who previously had very little opportunity for a kidney transplant, saving lives and impacting hundreds of patients and families. 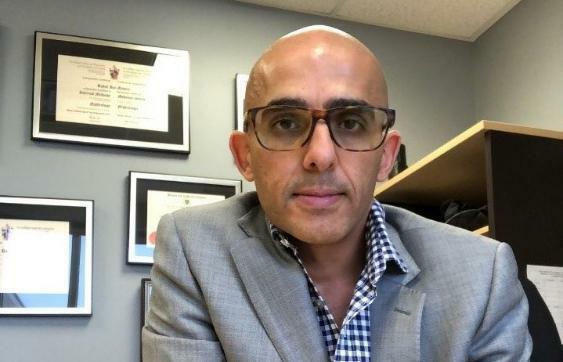 Of the more than 2,200 patients who are waiting for a kidney transplant in Canada today, almost 500 are highly sensitized, and therefore likely to reject more than 95 per cent of potential donor organs. 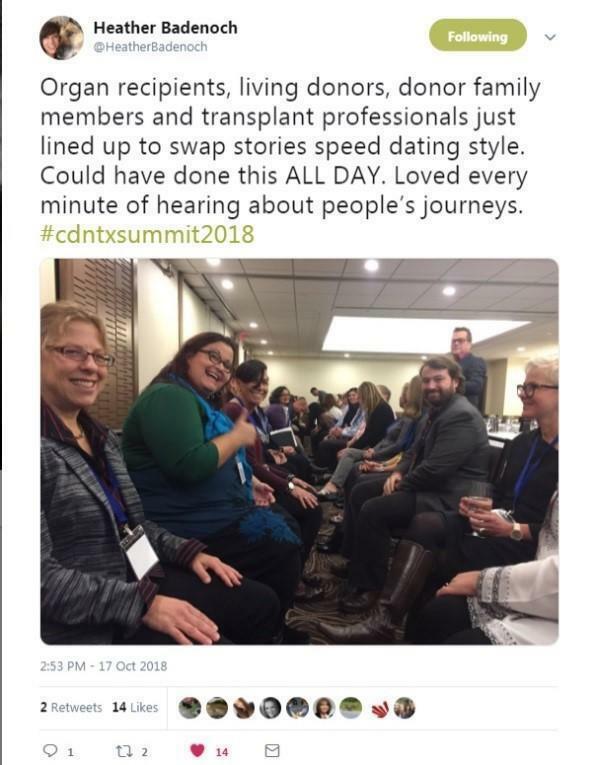 Historically, these patients have waited much longer for suitable organs, spent more time on dialysis, or died before a suitable organ match could be found. “With Dr. Nickerson’s leadership and collaboration with the team at Canadian Blood Services in launching the Highly Sensitized Patient Kidney program, health systems are now sharing kidneys across the country for one purpose: to find more Canadian patients a kidney, sooner,” said Dr. Graham Sher, CEO, Canadian Blood Services. 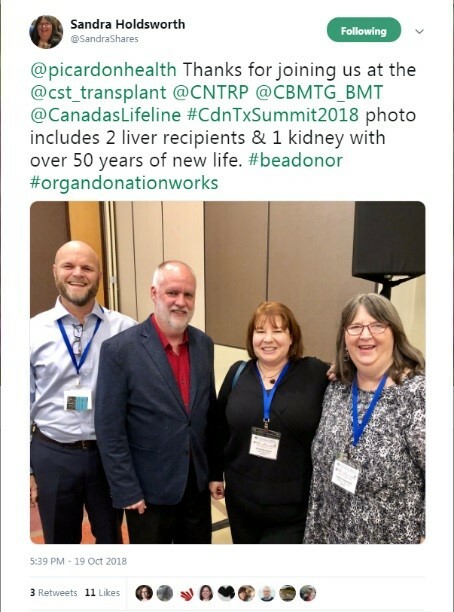 National kidney programs at Canadian Blood Services recently celebrated at milestone: 1000 kidney transplants that otherwise would not have happened. 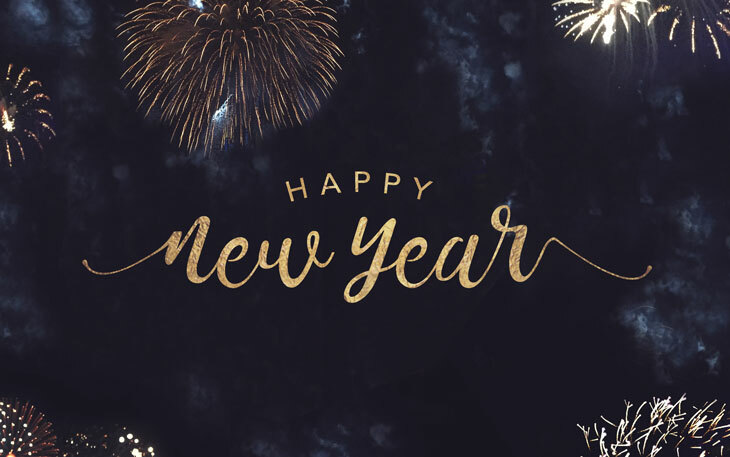 Dr. Nickerson is a Distinguished Professor of Internal Medicine and Immunology at the Max Rady College of Medicine, University of Manitoba, and Vice Dean (Research) in the Rady Faculty of Health Sciences. 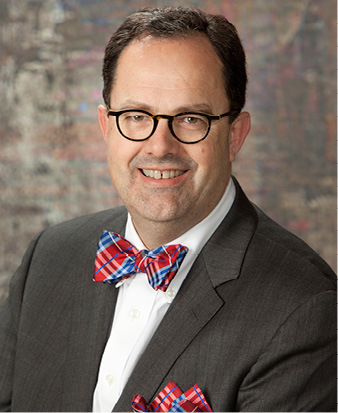 He holds a number of other senior positions in addition to the abovementioned, including Medical Director of Transplant Manitoba, Medical Advisor with Canadian Blood Services, Medical Consultant, Transplant Immunology Laboratory, at Shared Health and the Flynn Family Chair in Renal Transplant at the University of Manitoba. His research interests include transplant immunology, non-invasive diagnostics monitoring immune activation, and health policy and system design. Dr. Nickerson and his research team are developing non-invasive diagnostic tools (urine chemokine measurements) that are now in the final validation stages for use as diagnostic and prognostic markers. The researchers have also been recognized for their work identifying the role of HLA antibodies in causing premature kidney graft loss. Currently, the team’s research has been at the forefront of HLA molecular mismatch assessment, which is setting the stage for precision and personalized medicine in kidney transplantation. 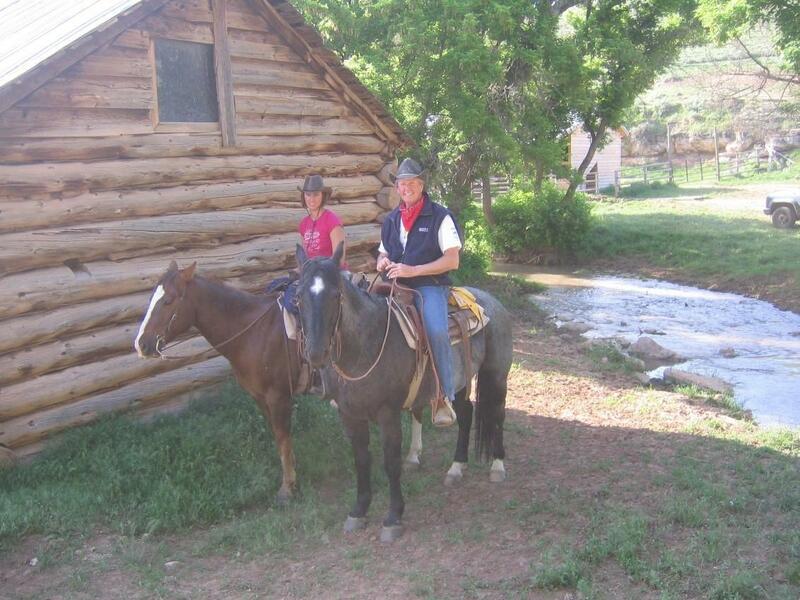 Read more about Dr. Nickerson's important contributions to kidney donation and transplantion. Dr. Peter Nickerson awarded the AST Clinical Science Established Investigator Award.